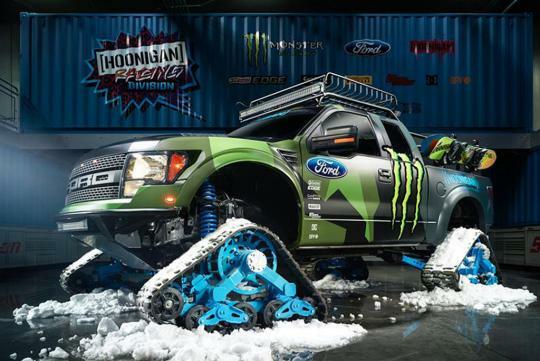 Ken Block has an all-new project: his Ford F-150 RaptorTRAX, the ultimate backcountry snowboard expedition vehicle. Block's RaptorTRAX also happens to be the world's fastest snowcat for backcountry snowboarding and will star in an upcoming video to be released Winter 2014/15. "This project is something I've had in my head for awhile now," said Block. 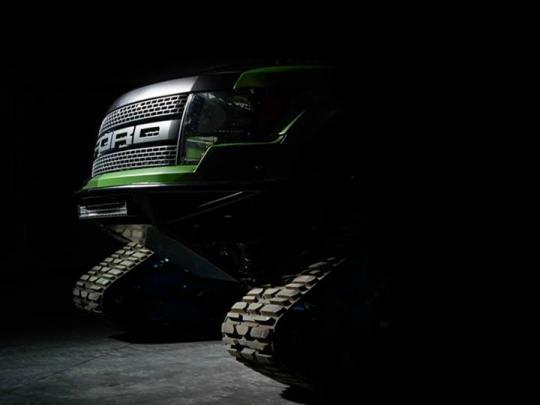 "I absolutely love my daily driver Ford Raptor, especially since I live out here in the mountains of Park City, so to build out this mountain assault vehicle with a Raptor as the base platform made total sense to me. It's an absolute beast of a machine and I'm stoked with how it's turned out. Next up is for me to take it deep into the backcountry ASAP to help me and some friends slay some powder on our snowboards for a video project due out later this year." Built from a Ford Racing prepared F-150 Raptor pickup truck and further enhanced by Special Vehicle Concepts in California, the truck features snowboard racks, a roof basket, a rear-mounted winch, interior storage for snacks and drinks, an exterior stereo setup for blasting music on-site and plenty of exterior-mounted Rigid Industries lighting to help guide the way, the RaptorTRAX is purpose-built to be the best tool possible for reaching serious backcountry powder. It’s not the first time Ken would be pulling out a snow stunt. A similar show was put up way back in 2009 when he joined hands with Subaru to make the world’s fastest cat track operation for snowboarding. In addition to the things that help make it the best for a day of riding, the RaptorTRAX has performance to back up the looks. Featuring a Whipple supercharged 6.2L V8, a full roll cage, Recaro seating and four burly Mattracks, there's not much that can stand in its way on the mountain. Comes with a roll cage? 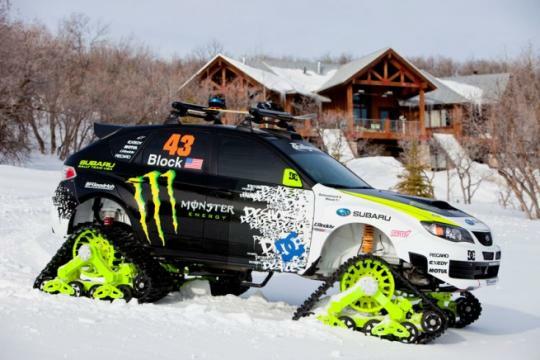 Michael Schumacher would not be in a coma if he had chosen this snow sport instead. Move like a tank, cruise like a boss.